Today started out better than it ended. It was a beautiful day, and all I needed to do was walk on the Santa Ana River Trail most of the way to Corona. On the Trail this morning I observed a bunch of guys from California Department of Fish and Wildlife on ladders inspecting a large birdhouse attached to a tree. 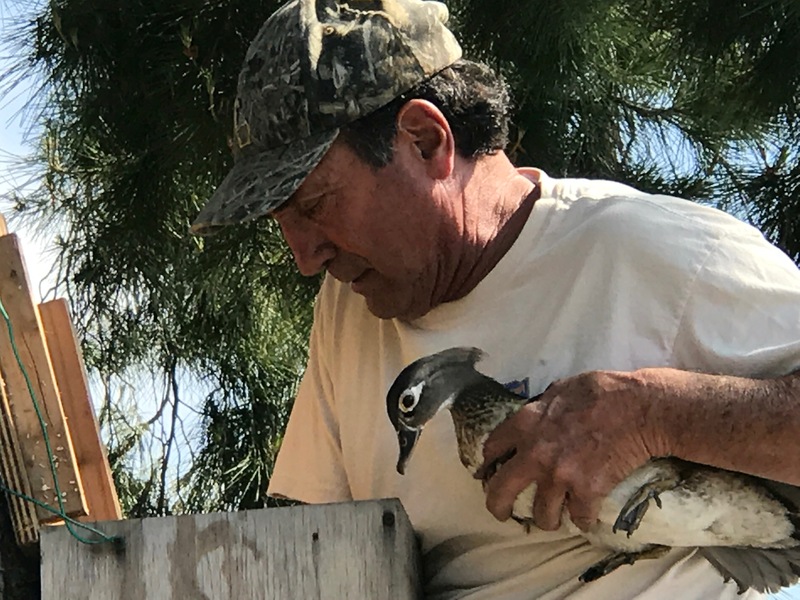 One of the men explained to me there were 36 boxes meant to house wood ducks, and each box was being checked for eggs. This particular box had 18 eggs in it! After the wood duck episode, I have to say that it was pretty much downhill. The Santa Ana River Trail is under major construction, with detours and blocked paths everywhere I walked. I took a long detour in Yorba Linda, only to have to double back a couple of miles when it did not lead to where I needed to go. Thus, two days in a row I wound up having to walk at least 4 miles longer than I had intended. Looking back on the day, however, it is the wood duck egg count that I will remember. The Santa Ana River Trail. <sigh> It sounds romantic, doesn’t it?And when you can see the River and there’s actual water in it, as well as water fowl, the fish are jumping (and the cotton is high), it is certainly glorious. However, much of the SART is basically a trail along a major freeway, accompanied by the roaring traffic’s boom, construction, detours, and occasional views of golf courses. Constructed mostly in the mid-1990s, the Trail is a monumental effort, and I appreciate that they’re working to improve it. But most of today I spent walking along freeways and construction sites. My brain is fried.